A new children’s book worth mentioning… because spring is upon us and birds are calling! By Hendrik Jonas, The Song of Spring is whimsically illustrated for bringing wonder and smiles to small ones. Reminiscent of Eric Carle’s famous style, it’s the story of a little bird who forgets his spring song. Along his journey in search of a friend, he meets a goat, cow, pig, cat, dog and more. The little bird imitates all of their sounds as they try to help… to no avail. It’s not until the female (migratory) bird appears from far away that the little guy remembers how to sing again. The Song of Spring is a great way to introduce small children to animals and birds. Descriptively written to captivate kid’s attention. Hendrik Jonas is a Berlin-based illustrator whose work has appeared in The Times and The Guardian. 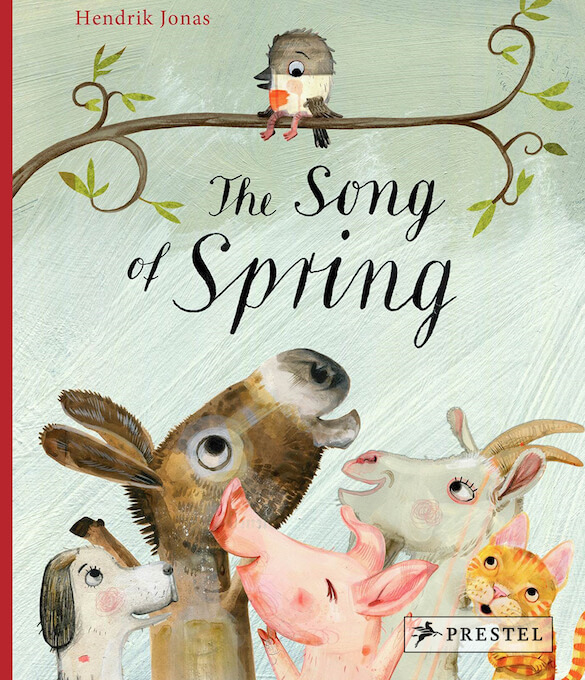 The Song of Spring is his third children’s book. Due March 2019; (ISBN: 978-3-7913-7379-9; Ages 2-5; Hardcover $12.95.